Arts and crafts have always been an important part of my life. My older sister Clare is an amazing artist, now and as a child–some of my fondest childhood memories were of our art sessions at the dining room table, where she taught me drawing techniques, human figure proportion and more. My father was both a talented woodworker (he made boats as well as furniture) and watercolorist. Dad believed in using high quality paper and brushes so we would head to Curry’s, the art supply store in downtown Toronto, to stock up on heavy blocks of paper and good brushes–it is one of the only times when price wasn’t our first consideration! I still have some of Dad’s brushes, these many years later. In junior high, I took Home Economics, learning more advanced machine sewing techniques than those taught me by my mother (she sewed many of our clothes and, believe it or not, the sails for one of my father’s boats!). In high school, my Art History class inspired even the jaded teen I had become, as I added color theory and weaving to my repertoire. 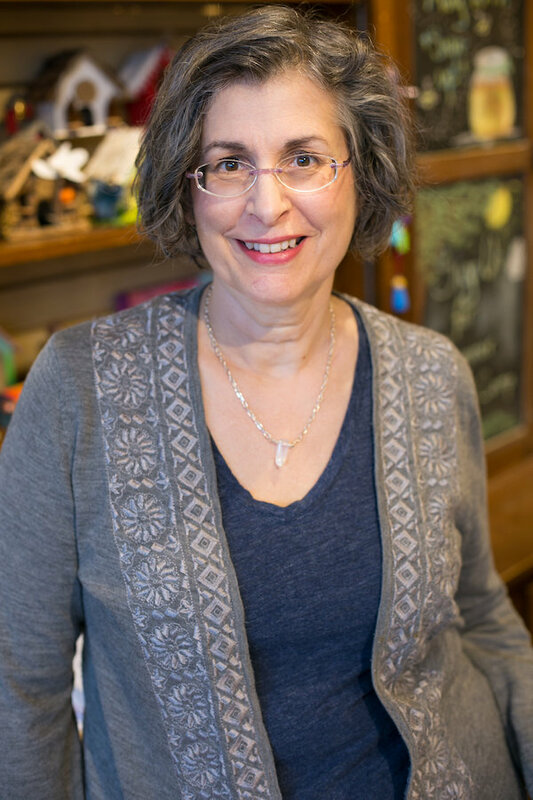 When I moved to Minneapolis with my husband and daughter, we happily discovered the Waldorf school, where my crafty girl flourished and I discovered parent handwork. For many years, I helped organize groups of parents as we made natural fiber dolls and animals, which we sold to raise funds for the school. My hand crafting and teaching skills grew and I learned to knit in an evening class at Southwest High School. Teaching crafts at Heartfelt feels like a dream come true and the culmination of a lifetime love affair with arts and crafts. I am thrilled and honored to share my handwork skills and enthusiasm for the handmade with you and your children. Important note: Whether attending our once monthly preschool festivals or visiting the store on a shopping trip, our space encourages low-key play with simple toys, a visit to the much beloved tree house, and even a cozy couch for relaxing. We have many wonderful toys for just this age, plus great resources for parents. Ask us, because we’ve been there too! And we have plenty of crafting projects perfect for young crafters!